Feel the amazing atmosphere of Wild West in the latest hidden object shootout. An impertinent bank robbery agitated a peaceful life of a provincial borough. Who dared to break the law? It's up to you, a local sheriff, to investigate the crime. Experience the spirit of adventure, meet iconic western characters, find faithful friends and true love on the Golden Trails: The New Western Rush. 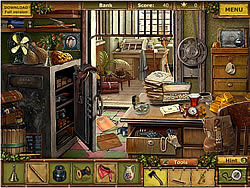 Pursuit, shootout, gold hunt, intriguing story and the romantic of Wild West will win the hearts of hidden objects fans.